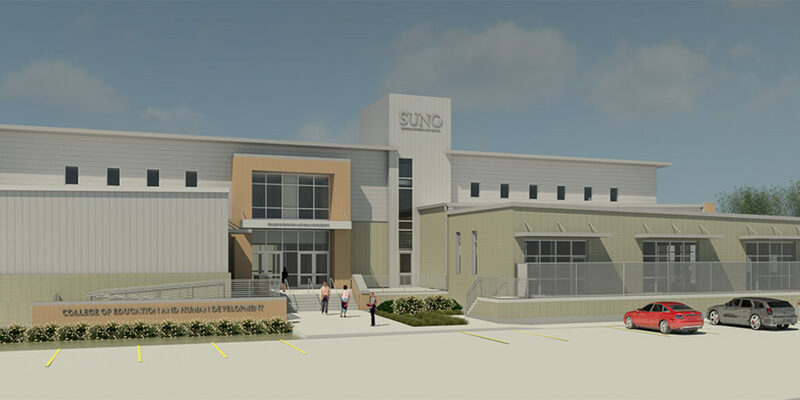 The new 49,700 square foot building for the College of Education and Human Development is part of Southern University at New Orleans’ post-Hurricane Katrina development of the SUNO Lake Campus. Now under construction, it will join the existing Faculty and Student Housing (designed by the Joint Venture team of VergesRome Architects and Bani Carville & Brown Architects), the School of Business, the Business Incubator, the IT Building, and the new School of Social Work Building on the University’s Lake Campus. The College of Education Building will provide a permanent home to the Education curriculum which was displaced to modular classroom buildings since late 2005. The new building will allow expansion of the curriculum and enhancement of the Education program through the addition of a Head Start Program and an Early Childhood Development Center. As the last of the buildings planned for the Lake Campus, the exterior materials and color palette for the College of Education Building are selected to blend with and complement the exteriors of the surrounding campus structures. As the public face of the Lake Campus, the building’s front façade will address Leon C. Simon Boulevard and its position will define the southeastern corner of the campus quadrangle. The building will provide classroom and laboratory space for approximately 600 adult students, a learning environment for 81 children from ages 18 months to 5 years old, and offices for a faculty of nearly 40. In addition to typical classrooms for 15 to 30 students, the classroom spaces will include an 80-seat auditorium, three interconnected classrooms, one nutrition classroom with a residential demonstration kitchen, and three classrooms with observation rooms with one-way glass. A TV Studio is provided to record and broadcast lectures for distance and online learning. For the safety and security of the children attending the Head Start and Early Childhood Development Centers, a separate entrance and parking area are provided. Each of the children’s centers will have three age-specific classrooms, a spacious indoor play area, a separate fenced outdoor play yard, and a central warming kitchen will serve meals from the University’s commissary for the children in these Centers.